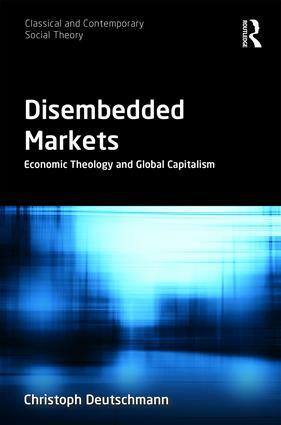 This book offers a sociological analysis of globalised capitalist markets, advancing the notion of ‘disembedded markets’ to challenge the idea of ‘social embeddedness’ common in economic sociology. Avoiding an exclusive focus on institutions, networks and trust relationships surrounding markets, the author concentrates on private property as the key institution of markets, in order to emphasise the historical origins of modern capitalism the free market narrative, and develop a socio-historical analysis of the disembedding process together with an account of the built-in contradictions and limits of market universalisation. Through an analysis of their encompassing character, this volume demonstrates that disembedded markets do not fit standard theoretical accounts of sociality – a problem taken up not only by Karl Marx, but also by Friedrich August von Hayek and Niklas Luhmann – and questions the attempts of the emerging approach of ‘economic theology’ to draw parallels between the practices that arise from disembedded markets and from forms of religious experience and ritual. A rigorous examination of the phenomenon of disembedded markets and the claims to which they give rise concerning the equivalences between religion and capitalism, this book will appeal to scholars of sociology and economics with interests in capitalism, social theory, and global markets. 8. Markets as an ultimate social reality? Christoph Deutschmann is Professor Emeritus and former Chair of Sociology at the University of Tübingen, Germany. He has worked as a research fellow at the Institute for Social Research in Frankfurt/M, at Tohoku University in Sendai, Japan, and at the WZB Berlin Social Science Center for Social Research in. His research interests and publications are in the fields of economic sociology, the sociology of work, and social theory.